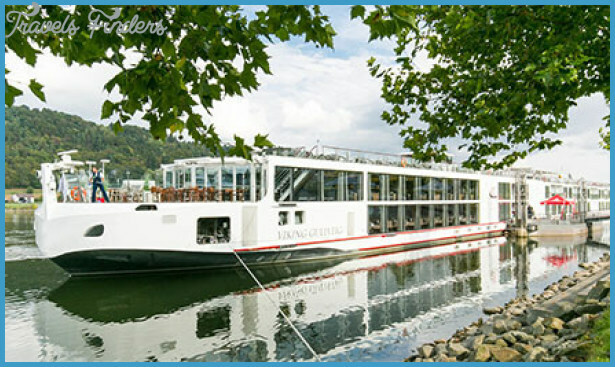 For many people Viking River Cruises is river cruising. It’s the Big Kahuna of the industry with more than 60 ships (which account for roughly 50% of the worldwide cruise market) and it’s the line you’ve seen in those exquisite ads on TV (most notably opposite Downton Abbey ). Affordable, destination-focused cruising on comfortable ships is Viking’s calling card. Extremely Well-Oiled Operation: You can expect a high-quality experience on any of Viking’s ships. 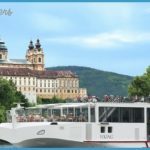 Innovation: The Viking Longships with their snub-noses, outdoor dining, green features (including solar panels), whisper-quiet engines and cabins with balconies did no less than change the course of river cruising for the better. Fun Documentation: In a world of print-it-yourself’ e-tickets and documents, Viking’s document package makes for a great surprise: Coming in a silver box, it includes a bound cruise document containing transfers, maps, flights and cruise information, along with leather luggage tags and one of the best pocket, river-specific guidebooks we’ve seen. 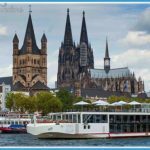 Diverse Itineraries: Viking not only has plenty of European itineraries but also fascinating voyages through Russia, China, Vietnam, and Cambodia, and even along Egypt’s Nile River. No Pool, Spa, or Fitness Facilities: The line will make recommendations for facilities you can visit along the way but doesn’t believe in using space for that sort of stuff on board. 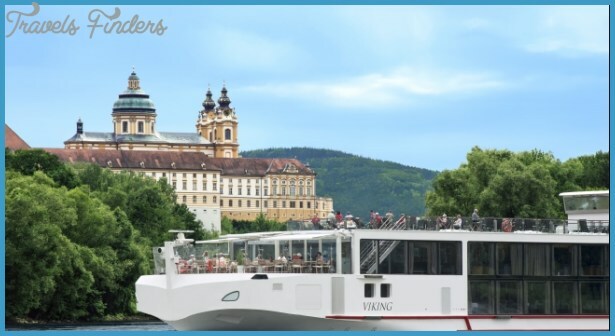 In many ways, Viking created Modern River Cruising. Founded in 1997 by cruise industry veteran Torstein Hagen, Viking started with cruises in Russia and has had a meteoric rise to become the king of the river cruising world with 50% of the worldwide market. In fact, Viking broke a Guinness World Record in 2013 for the number of ships launched in a single day, christening 12 new Viking Longships in a massive ceremony in Amsterdam They beat their own record the following year by christening a whopping 18 new vessels in 24 hours over three separate cities: Amsterdam; Avignon, France; and Porto, Portugal. 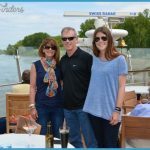 The model for the river product (adopted by the ocean product as well) is value-priced, mostly inclusive cruises, with wine and beer at mealtimes, Wi-Fi, airport transfers, port charges and, most importantly, daily shore excursions included in your cruise fare. Locks, but these wonderfully contemporary ships were cleverly designed with a snub-nose rather than a traditional pointy bow. This change allowed the line to add a partially windowed, open-air outdoor dining area what Viking calls the Aquavit Terrace. Founder Hagen, with the help of the ship architects Yran & Storbraaten (who also created interiors for ocean ships including the Disney Dream and luxury line Seabourn’s Odyssey-class ships), also cleverly had the idea to move the hallways to one side so the ships could offer true two-room suites, plus cabins with real, step-out balconies as on ocean ships, without going over the river width restrictions. The de-centralized hallway also allowed for a greater number of cabin configurations and categories. Green advances included hybrid diesel-electric engines partially fueled by solar panels. Spending for onboard cuisine went up. Passenger amenities were scaled up, and onboard costs scaled down. Popular shore excursion options are provided free of charge, with more off-the-beaten-path excursions offered at a modest cost. Wines are so free-flowing during lunch and dinner that you’ll never see the bottom of your glass. The line’s ships offer all the comforts of a decent hotel the Longships may remind some of W Hotels with their streamlined, contemporary decor and upscale accouterments. You sleep in a cabin with a comfortable bed and can pay extra for perks such as a French balcony or a real veranda or even a two-room suite. You hang out in comfortably cushy spaces including the main lounge. All cruises come with three meals a day, with wine and beer included at lunch and dinner (you can also request complimentary mimosas at breakfast). 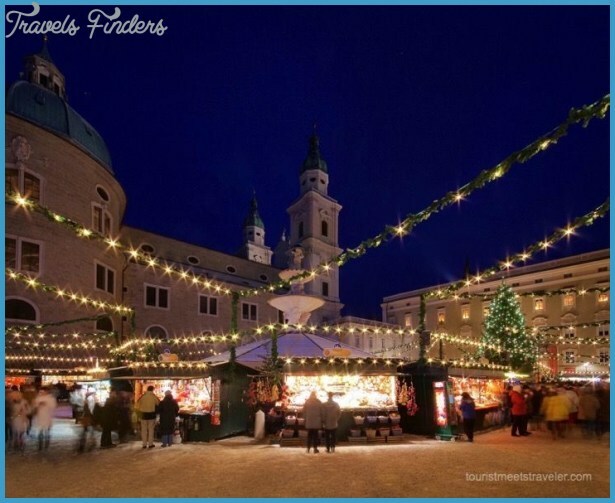 Daily tours are included, premium tours available for an extra fee such as a BMW Factory experience in Munich or an evening Fado concert in Lisbon. 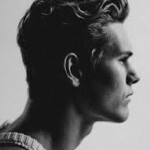 That said, founder Hagen does things his way or the highway, and if you don’t like his style, well too bad. On his ships you won’t find many bathtubs (he prefers showers). You won’t find pools or fitness rooms or spas on ships because Hagen believes those are underused spaces. But you will find salmon and oatmeal available every day (he’s Norwegian!). And each ship carries a well-stocked library, situated on the upper level of the glass-enclosed atrium and loaded with titles on history. A lot of people agree with Hagan’s tastes. 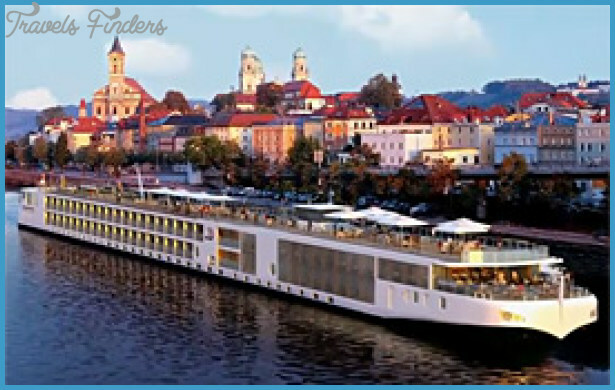 Viking is the dominant cruise line in Europe and also offers cruises in Russia, China, in Southeast Asia (the Mekong and Irrawaddy) and in Egypt. 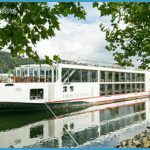 The line is gearing to introduce cruises on the Mississippi in 2018; and started offering ocean-going cruises in 2015 (see p. 275 ). Hotel operations for all the ships are run out of Switzerland. Perhaps most surprising, is Viking has managed to maintain a consistent level of quality as it has grown. Itineraries are well planned and very much focused on making sure you see the key sights en route. The idea is that you explore a region without being nickel-and-dimed. Viking gears its entire product to age 55-plus. Many on board will be way plus, though still active enough to do the included tours. Nearly all on board will be English-speakers and most Americans. The dress code is casual at all times (though some dress up slightly at night) and the folks on board like it that way. Expect mature, social fellow passengers who are interested in history and culture and travel. Some great sailings in Russia, where Viking first got its start back in 1997. Elsewhere, China is a primary focus for the line, which operates three cruisetour itineraries ranging from 13 to 18 days there. 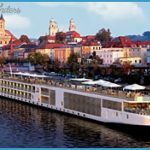 Viking also offers cruises along the Mekong River (Vietnam and Cambodia), the Nile (Egypt), and, historically, the Ukraine’s Dnieper, though it’s not known when Viking will be able to operate a full season in the latter again. Meals are served in the main dining room, and on newer ships there is alternative dining in the Aquavit Terrace, which is an al fresco extension of the main lounge. Breakfast and lunch are buffet style. Dinner is a multi-course menu that includes a choice of local specialties and continental dishes. Improved menus have added a more modern slant, so you might have potato ravioli with sabayon sauce and a sauteed black cod, tuna sashimi and carved roast veal. Always available are New York-cut steak and salmon. A light buffet is available at breakfast and lunch (the latter will be at the Aquavit Terrace on the Longships, or on other ships in the lounge) Offered once on each sailing on the Sun Deck, don’t miss the buffet of local snacks (the line calls the spread A Taste Of ) featuring such treats as pretzels and sweet mustard leberwurst and Kolsch (beer) in Germany or grilled local sausages, vegetable skewers with feta, cevapcici (minced meat kabob), baklava and local beer in the Balkans. House wine and beer are included with dinner, and you can order complimentary mimosas if you want at breakfast. Cocktails and premium wine are extra (added to your tab). Viking also has the option of Beverage Packages that include cocktails and wine for those who prefer an all-inclusive drinks experience (priced at $210 per person for a seven-day cruise). 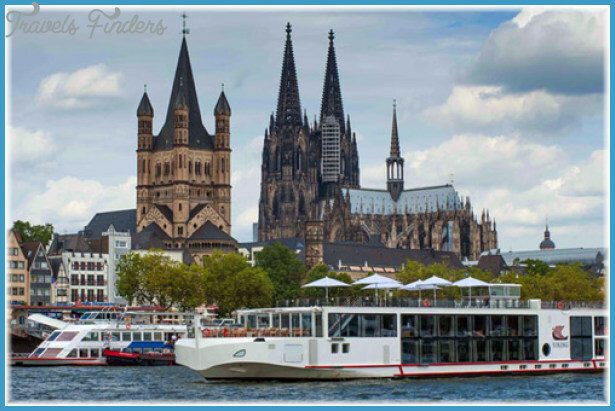 The primary daily activities on a Viking River cruise are, of course, tours ashore. Viking offers a number of daily options for exploring in most cities, including a gentle walkers group for those with mobility issues or who want to spend more time admiring the sights and don’t mind covering less ground. 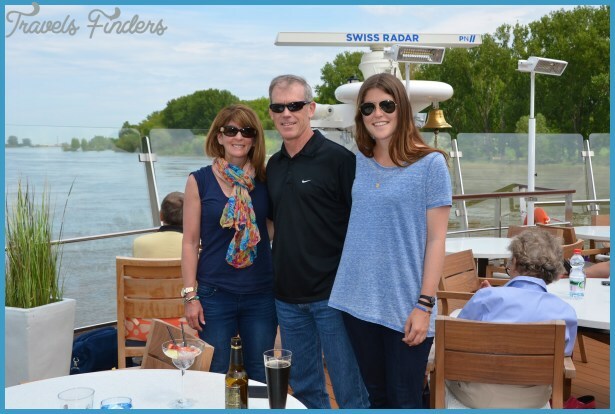 The line also likes to focus on options for the independent traveler, like a guided shore excursion in Vienna that teaches guests how to use the U-Bahn metro. Every port has at least one complimentary excursion options, though some additional-cost excursions are offered alongside. Note that Viking doesn’t offer onboard bicycles as an option for shoreside exploration, as some lines do. On board, there will be lectures and multi-media presentations on local history and culture. So, on Bordeaux itineraries there might be a presentation on local wine; in Holland, an included lecture could tell tales of the Dutch Masters artists; and on many sailings, the cruise director teaches words and phrases in the local language. The newer ships have a walking/jogging track and a putting green on the Sun Deck. There are no bikes on board and most of the ships do not have fitness facilities, spas or pools. None. Viking doesn’t actively cater to children, or offer any special amenities or sailings. If you’re thinking of bringing kids (or even teenagers), you might do well to pick another line with dedicated family-friendly sailings. Lounge at night, doing classical music and modern and even pop melodies, including during cocktail hour. Depending on the ship, a combo may play for dancing at night. The lounge may also double as a movie theater, the films chosen for their local connection. The hardworking mixed European and Filipino crew focuses on efficiency, but the atmosphere is friendly and few passengers have any complaints. In fact, the line is so sure your needs will be attended to they offer a service guarantee if a problem is not corrected within 24 hours you can leave the ship and get a refund. Gratuities are not included in your cruise fare, but are collected at the end of the cruise (you can pay in cash or by credit card), in one lump sum, which is then divided among the crew. Recommendations vary by itinerary, but in Europe the recommended total adds up to about $15.25 per person, per day ($2.18 for the program director and the rest for the waitstaff, bar team, room stewards and other service crew). Viking’s fleet consists primarily of new (or close-to-brand-new) Viking Longships. While there are some noteworthy differences in things like the placement of electrical outlets, light switches, and materials used throughout, these ships are more or less identical in design and layout. Well-built and wonderfully quiet (we didn’t even realize we were moving until we’d sailed halfway out of Amsterdam on our first Longship cruise), Viking has been tweaking the Scandinavian decor of these ships based on customer feedback, and the results are apparent. Each Longship holds up to 190 guests, and features accommodations ranging from value-added Riverview staterooms to each vessel’s two massive Explorer Suites situated at the stern. Viking still has a few of its older vessels clinging on for a few more seasons, but they don’t have much longer to go as new Longships are added each spring. There’s nothing wrong with the older vessels like Viking Legend and Viking Prestige, but compared to their sleek new sisters, they do look a bit dated. These are the least like what you might think a cruise would be like. Each has its own personality, from the Alaska Marine Highway System which is a bare-bones ferry service that happens to have cabins you can sleep in (on some ships), all the way to Lindblad Expeditions, which focuses on its educational program more than any other line, and Un-Cruise Adventures, whose ships feel like oversized yachts. The niches can differ greatly and that’s their charm.